Pit Bulls are often regarded as a vicious and dangerous breed. However, there are more than enough evidence to support the fact that they are very loving and caring dogs. Some Pit Bulls have bad records due to improper training and years of abuse. It’s important to understand that any dog can become vicious under such circumstances, not only Pit Bulls. In this article, we share a few stories of Pit Bulls who kept their faith in humans even after being misused, neglected and abused. 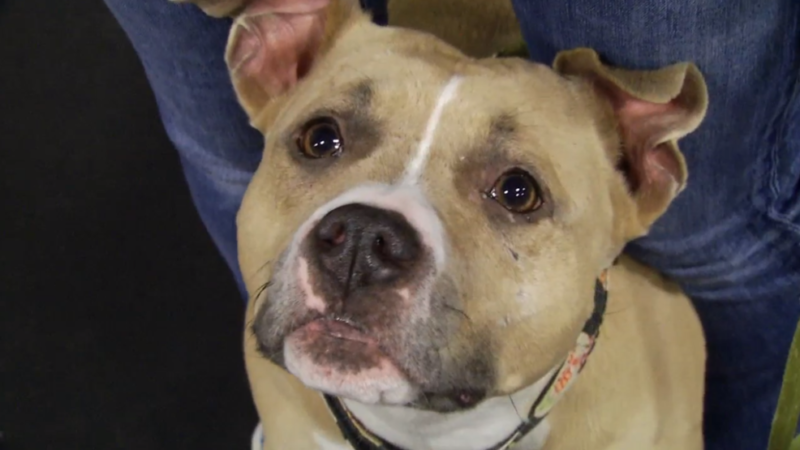 These Pit Bull rescue stories are a testimony to how misunderstood the breed is. For more Amazing Pit Bull Rescue Stories, read Part 1 and Part 3 of this article. This Pit Bull was abused by criminals. Rescuers found him locked in a freezer to die that led to him being called Popsicle. Despite being treated by humans in such a horrible manner, Popsicle went on to serve humans by becoming one of the most successful drug busting dogs in the world. One of his busts included a truck full of cocaine worth of $139 million! He has now retired and lives a happy life with his new family. He was just a young pup when he was rescued from a multi-state dog fighting ring. The photo of a sad looking Timmy wearing a huge chain was publicized soon after. Despite being so poorly treated at such a young age, he grew up to become a wonderful companion. He’s now a very happy and healthy Pit Bull who loves his family and even his neighbors and their pets. You can find how to safely tether your Pit Bull in this article. This Pit Bull was one of the first dogs to be adopted from the group of Pit Bulls who were rescued from Michael Vick’s dog fighting ring. Dan is quite old now and has become the perfect nanny for his human baby sister. His family also includes another dog and two cats. Dan’s dog parents were so inspired after adopting him, they started a dog training group called Handsome Dan’s Rescue. The group works on training shelter dogs, so that they have a better chance of finding homes. These Pit Bull rescue stories show how Pit Bulls can become great family dogs even after being treated so horribly early on in their lives. It’s needless to say that a Pit Bull will become an amazing family pet if they are given proper training and care in a loving environment. Read more Amazing Pit Bull Rescue Stories, by visiting Part 1 and Part 3 of this article.